Is your community wealthy? How you answer that question depends very much on how you define “wealth.” You might picture as a wealthy community a place like Vail, Colo., or the skyscrapers around Central Park in New York City—places with luxury that reflects the full bank accounts of the people who live there. You might picture as a wealthy community a place like Vail, Colo., or the skyscrapers around Central Park in New York City—places with luxury that reflects the full bank accounts of the people who live there. That is wealth in one sense of the word. But some researchers have found that when it comes to building prosperous communities, a much broader definition of wealth is necessary. Money is still important—but it is just one of the kinds of wealth that successful communities have in abundance. And focusing too much on any one form of wealth can mean the community overall suffers. Cornelia and Jan Flora, researchers at Iowa State University (both now professors emeriti), pioneered this way of thinking about wealth over several decades. They called it the Community Capitals Framework. “Based on their research to uncover characteristics of entrepreneurial and sustainable communities, they found that the communities most successful in supporting healthy sustainable community and economic development paid attention to all seven types of capital: natural, cultural, human, social, political, financial and built,” according to the ISU Department of Sociology website. 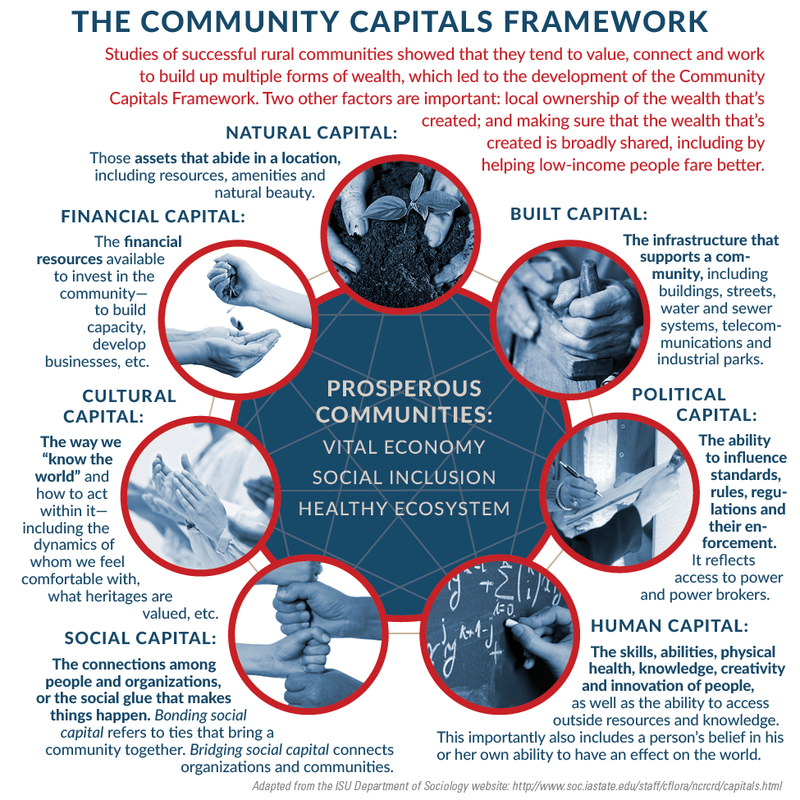 Capital, in this way of thinking, is a source of wealth—an asset that can enrich the community. And it’s all those capitals together that make a community prosperous. It takes a different kind of thinking than traditional economic development, explained Deb Markley, managing director for the Center for Rural Entrepreneurship. Markley has been involved with a Ford Foundation-sponsored project called WealthWorks, designed to test an approach to economic development that defines wealth more broadly. A person could have a job, but not be able to afford child care, health insurance, or to buy a home, for example, which means that job is just a job—“it’s not leading to wealth creation in any way,” Markley said. Whether assets increase or are used up is another difference between traditional economic development and the Floras’ broader view of community development, explained Mary Emery, head of the Sociology & Rural Studies Department at South Dakota State University. Part of Emery’s work has been to help communities use the Community Capitals Framework. “If you look at some of the traditional or narrowly focused economic development programs, oftentimes they use up existing assets in communities, particularly financial capital and political capital,” Emery said. For example, “we go to state government and ask for help bringing a company into the community. You can only do that a couple of times,” and then that political capital (or power, in this case) is used up. If a community instead brings together resources from all of the capitals to get a project done, the process of bringing people together can increase the capital available: The connections between people are stronger, and individuals increase their human capital as they gain skills and experience, for example. It doesn’t always work that way. Sometimes there are trade-offs in which one kind of wealth is spent down to increase another. But this framework brings those trade-offs into the open. Markley and Emery explained that the capitals are a planning tool for communities as they consider ventures for their communities, as well as an assessment tool to help them gauge how well they’ve done. The first step is often figuring out where a community stands now: What forms of capital does it have in abundance? What is it lacking? This is vital, because many rural wealth creation efforts are tied to the resources in a specific place—they often can’t be copied by a community in a different place, explained John Pender, a researcher for the U.S. Department of Agriculture’s Economic Research Service and author of the book Rural Wealth Creation. On the other hand, “Communities can learn from other communities that have faced similar issues,” Pender said—a process that starts with communities knowing themselves first. Planning with those capitals in mind starts to shape how communities go about creating solutions. Markley described one WealthWorks project site in the Lower Rio Grande Valley, where there was a strong demand for affordable, energy-efficient housing. Unfortunately, no one in the region knew how to build that way. There was a builder in Houston who had exactly those skills. If community leaders had not been thinking in terms of building multiple forms of wealth, they might have gone with the easy answer: Hire that builder to put up the kind of housing they wanted. But that would not have built up any assets in the community; they would in fact be sending wealth out of the region for every house they built, now and in the future. Instead, they told the builder what they really wanted was his help in setting up a program at the local community college to train people in the region to build energy-efficient houses. He said he’d be happy to, and spent six months in the region setting up the training program. Instead, the overall goal is to create a system where all the sources of wealth are increasing through positive feedback loops, so that when one source of wealth goes up, another source of wealth that’s connected to it also goes up. It sounds kind of far-fetched—like a perpetual motion machine. But it’s possible because many of the assets in a community are currently dormant; bringing those assets into the system gives the system a whole lot more energy. “Assets,” in this case, most often means people. “Those communities that focus on getting people involved and thinking about what the community should be and working toward helping people reach that vision of what the community could be … asking them what they are interested in and helping them find ways to act on those interests … those are the ones where you’re building assets across the capitals,” Emery said. In the work she’s done in communities that are clearly becoming more prosperous, Emery has found that changing the cultural capital in a community—their everyday ways of thinking and doing—had the most profound impact on their efforts. Besides considering multiple forms of wealth, the WealthWorks framework has two additional principles: focusing on local ownership and bringing people in from the economic margins. If the focus is on attracting industry from elsewhere, Emery said, what typically happens is the industry that comes in is a subdivision of an existing plant. Markley said this kind of focus on entrepreneurship—helping the people who are already rooted in a community to grow and prosper—has become much more common in the 15 years she’s been at the Center for Rural Entrepreneurship. “I think there’s much more of an appetite at the local and regional level to recognize what you have, and I think there is stronger social capital to begin to build relationships that you need to do this kind of economic development,” she said. Those relationships are important in part because they help to make those types of investments less risky—they bring in expertise that makes better decisions more likely, and it spreads the risk around so it doesn’t weigh too heavily on any one party. The final principle in the WealthWorks framework is making sure that wealth reaches people on the low end of the income spectrum. This criterion is often neglected in community planning, Markley said. And yet, it’s a vital part of wealth creation in a community: “It’s not wealth unless it’s broadly shared,” she said. The U.S. Department of Agriculture adopted a focus on rural wealth creation when Secretary Tom Vilsack took the helm in 2009, Pender explained. The USDA has used that framework for explaining the work it has already been doing—increasing built capital in communities, for example, or increasing human capital through training—as well as discussing potential policy changes. Pender thinks there will be continued interest under Vilsack to be more holistic in how USDA officials think about rural development, bringing multiple types of wealth into the conversation. One of his plans as a researcher is to think about how to measure wealth in other capitals—which could affect whether other forms of wealth are considered in policy decisions. We measure what we value and value what we measure, as the saying goes, so some measurement might help other forms of wealth be valued more highly in government and community decision-making. Imagine, for example, a project before a review board. “If you have people on one side that are standing there with all the numbers—how many jobs this project is going to create in the near term and so on, and people on the other side don’t have anything—they just say, ‘we don’t really like it’”—the side with the numbers tends to get more consideration, Pender said. Developing some ways to measure other forms of wealth could help decision-makers better understand what’s at stake in the proposed project. So, back to the question we asked at the beginning: Is your community wealthy? The stories that follow highlight some of the forms of wealth found in our region. Many stories show that communities are rich in more than one form of wealth. There probably aren’t too many of our neighbors sitting in the lap of luxury—but many of our communities may in fact be far wealthier than we might have considered before.